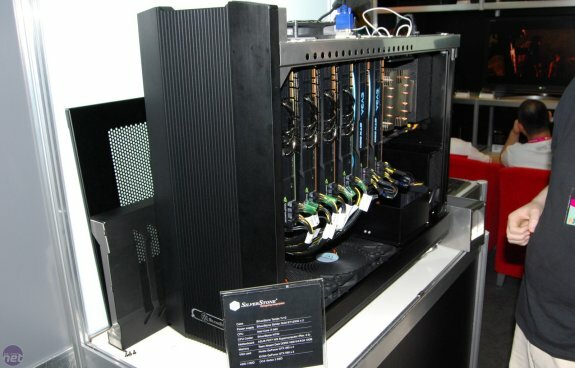 Bit Tech spotted SilverStone's TJ12 concept at Computex. 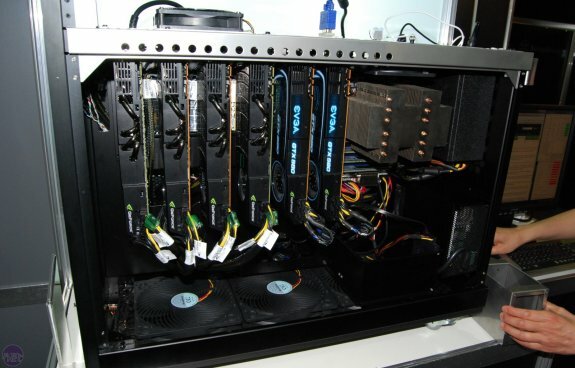 This model offers a bottom-to-top cooling design and is roomy enough to comfortably fit up to six dual-slot graphics cards with breathing room between each of them! This feat is made possible via a series of PCIe extender cards, and the case also features other novelties such as support for two power supplies, room for a pair of triple 120mm radiators and a modular top. There's also room for a pair of PSUs inside this behemoth of a case, as well as a pair of triple 120mm radiators in the base. Interestingly, Silverstone has also done away with 5.25in and 3.5in mounts inside the TJ12; only 2.5in mounts remain, meaning you’ll need to stock up on SSDs or laptop hard disks if you want to house a system inside the TJ12. Silverstone also aims to make the top of the case modular. As such, if you didn’t require the mounting points for the extra pair of graphics cards, you could swap these out for an additional PSU mount instead. Also on show was Silverstone’s new prototype passive CPU cooler, which is huge in its own right but somehow looks reasonably sized inside this case. It's unknown if the case will ever hit retail stores, the market for such a beast must be pretty small.